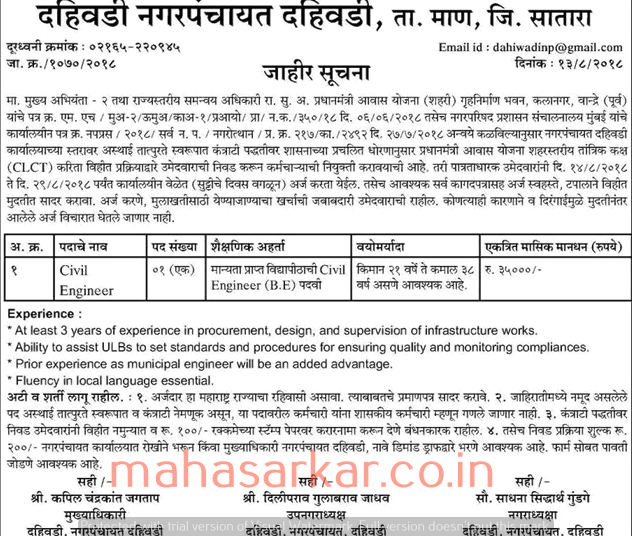 Dahiwadi Nagarpanchayat Satara (Dahiwadi Municipal Council Satara), Satara Published Job Notification for 01 Civil Engineer Posts. Candidates who wish to apply must look at Dahiwadi Nagarpanchayat Satara Civil Engineer Recruitment 2018. Eligible candidates can apply Offline before 29-08-2018. Dahiwadi Municipal Council Satara published Job Advertisement telling to apply Dahiwadi Nagarpanchayat Satara Recruitment 2018. This new advertisement is about the vacancies of Civil Engineer. Totally there are 01 Vacancies. Candidates are advised to read official notification carefully before applying. Education Qualification: BE in Civil and More. For Post wise Education Details follow the detailed advertisement. Interested & Eligible candidates can send their application along with all the necessary documents and testimonials to Dahiwadi Nagarpanchayat Karyalay, Ta. Man, Satara. Starting Date, Last Date to Apply Offline at Dahiwadi Municipal Council Satara which candidates should be remembers as follows. Start Date to Apply Offline: 16-08-2018.